As predicted yesterday, Syrian Army troops have captured the town of Madyara. 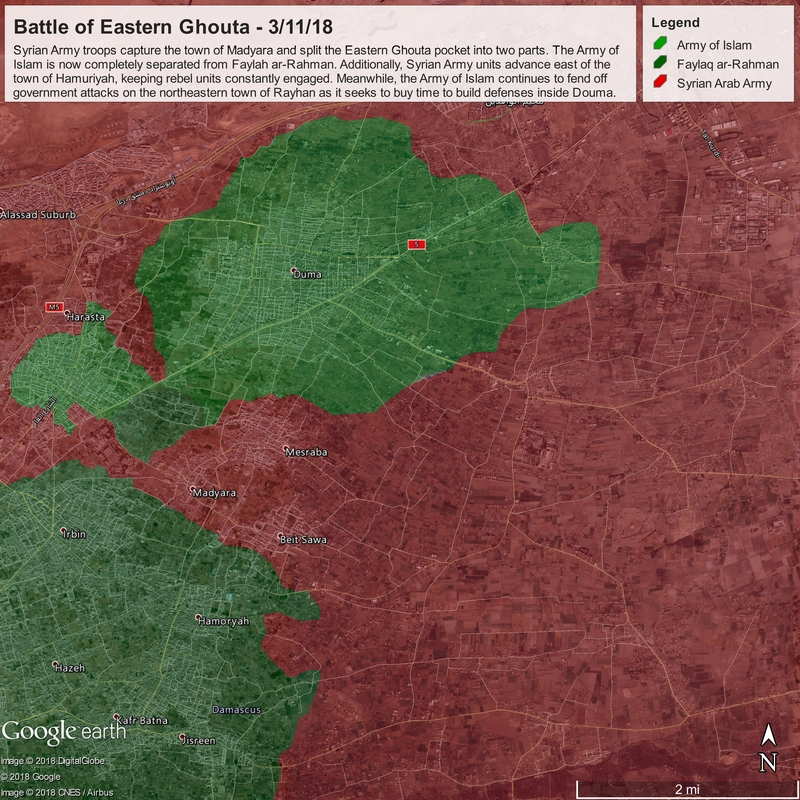 This crucial move splits the Eastern Ghouta pocket into two parts: the Douma pocket and the Irbeen pocket. The Army of Islam (in the north) is now completely separated from Faylah ar-Rahman (to the south), and the Syrian Army will expand the corridor between Madyara and Harasta tomorrow. Additionally, Syrian Army units advanced east of the town of Hamuriyah, capturing several farms and keeping rebel units constantly engaged. This positions government forces to capture Hamuriyah and threaten Jisreen. Faylaq ar-Rahman seems to be incapable of defending open fields and farmland, preferring city warfare. Government artillery and airstrikes struck all rebel-held cities except Douma. Meanwhile, rebel forces shelled areas all over Damascus, hitting ten neighborhoods with dozens of mortars. Seven civilians were killed in this exchange of shells, and several dozen were injured. Meanwhile, the more experienced militants of the Army of Islam continue to successfully fend off repeated government attacks on the northeastern town of Rayhan as it seeks to buy time to build defenses inside Douma. This defense will not last long however, as Rayhan is almost surrounded and under constant bombardment.